Mary Cummins, investigative reporter, writer, speaker, activist in Los Angeles, California: Mary Cummins wins Kathy Knight-McConnell lawsuit "Mary Cummins - Cummins Real Estate Services, appraiser, appraisal in Los Angeles, California - Mary Cummins, Cummins-Cobb, Cobb"
On July 7, 2003, Kathy Knight-McConnell sued Mary Cummins for securities law violations, trademark infringement, defamation, and other claims in federal court in New York. At the time of the litigation, Knight-McConnell ran a forum for investor discussions and published a newsletter on various stocks. According to a court decision in the case, Cummins, a stock trader from California, posted statements on website discussion groups and on her own website describing Knight-McConnell as a securities fraud "criminal" and "paid to lie to investors," among other things. In addition, Knight-McConnell alleged that Cummins intentionally maligned certain stocks that she promoted in order to drive their price down in violation of the securities laws. Knight-McConnell also claimed that Cummins violated trademark law by linking to Knight-McConnell's website without permission, using Knight-McConnell's name in the post-domain path of URLs for seven of her web-pages, and posting links on Internet chat forums and discussion boards directing users to visit these pages. "Even if we assume that plaintiff's name is a valid and protectible mark, plaintiff has not alleged that the defendant engaged in any conduct that is likely to cause confusion as to the origin of the defendant's website. The mere appearance on a website of a hyperlink to another site will not lead a web-user to conclude that the owner of the site he is visiting is associated with the owner of the linked site. This is particularly true in this case because defendant's website advertises real estate and web design services, not investment services, and defendant is continuously dissassociating herself from plaintiff by criticizing her and accusing her of misconduct." Judge Buchwald also determined that using Knight-McConnell's name in URL paths was not likely to cause confusion as a matter of law because a URL "merely shows how the website's data is organized within the host computer's files" and does not suggest affiliation, source, or sponsorship. 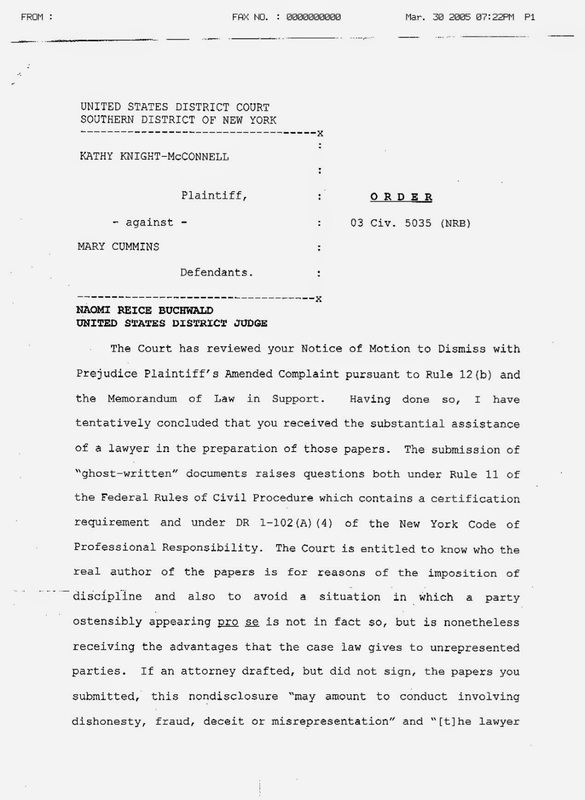 Looking at Knight-McConnell's many state law claims, Judge Buchwald determined that the complaint likely stated a cause of action for defamation, but that a defamation claim was not sufficient to confer personal jurisdiction on the court. Buchwald indicated that Knight-McConnell's tortious interference with contract claim might be sufficient to establish jurisdiction under New York's long-arm statute, but that Knight-McConnell had failed to adequately plead this cause of action. The court dismissed the complaint without prejudice and granted Knight-McConnell permission to amend her complaint. 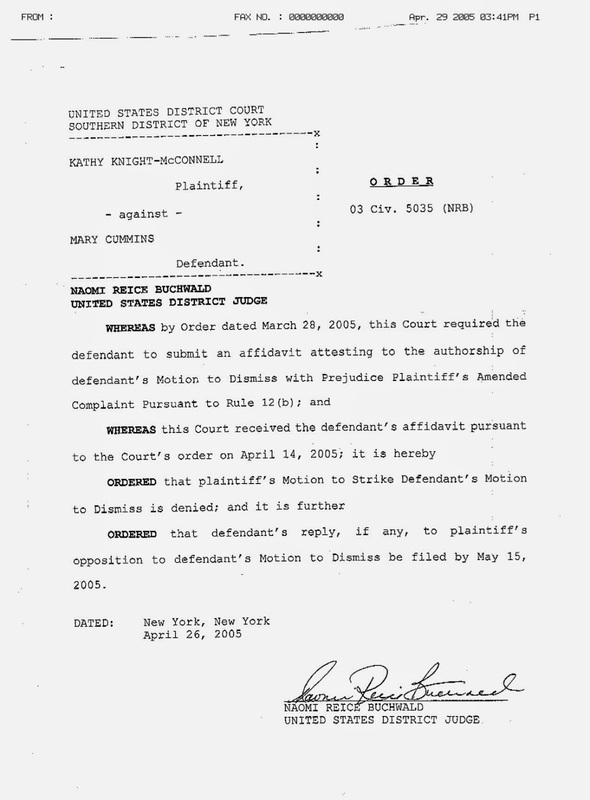 Knight-McConnell amended her complaint, but, upon a renewed motion by Cummins, Judge Buchwald dismissed the case for lack of personal jurisdiction in June 2005. Independent review of the case by Citizen Media Law Project. I have no idea why these people had an interest in this frivolous case. Of course this was the very beginning of internet law. Mary Cummins is a real estate appraiser in Los Angeles, California. She also advocates for the protection of investors from stock scams especially those perpetrated by company paid stock promoters. She aided the SEC in their prosecution of stock promoter John Westergaard in 2000 and 2001. She also warned investors about stock scams involving the following companies, TMOT Titan Motorcycle Company, EZR Easyriders, UMCC Ultra Motorcycle Company, NPCT Nanopierce, JNOT Jag Notes and others. Kathy Knight-McConnell was a company paid stock promoter at the time of the lawsuit. She worked for Nanopierce symbol NPCT. NPCT was never profitable. Here is her old website. I saved copies of all of it. Click "about" to see her photo of herself. Click "boycott raging bull" to see how she feels about me. Click "NPCT" to see her paid tout job. I wish I could find her original complaint. I had to read it three times just to try to figure out what the hell she was suing me for. It was all over the place. Finally figured it out and replied. 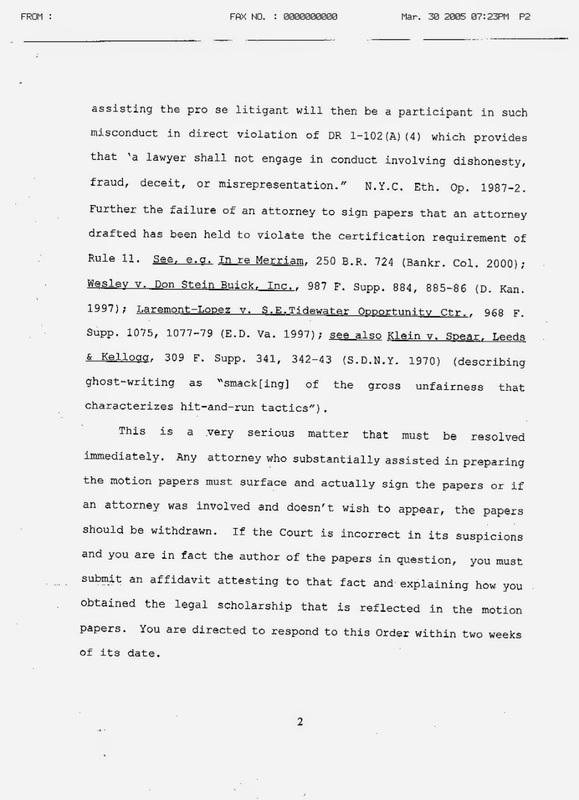 Knight-McConnell then filed a motion to strike my motion to dismiss claiming I had a ghost writer. 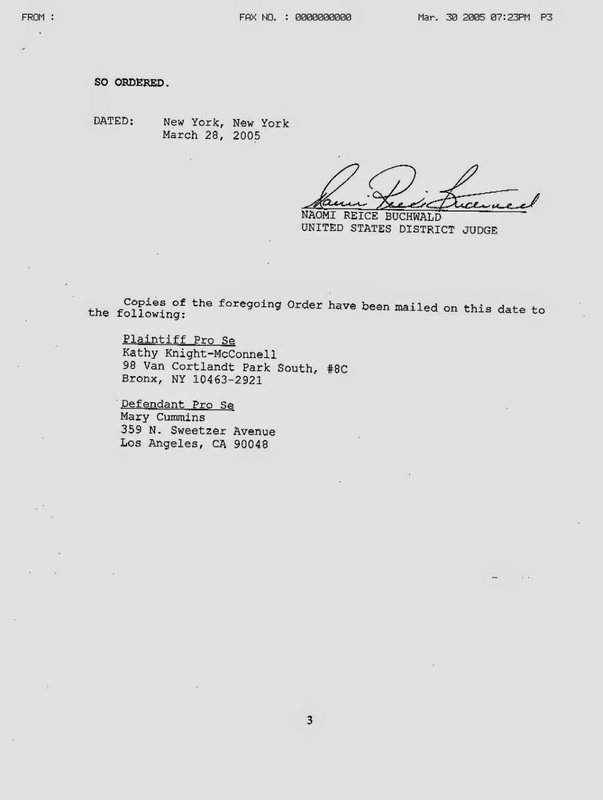 March 25, 2005 Judge Naomi Reice Buchwald orders me to "send an affidavit attesting to the fact and explaining how you obtained the legal scholarship that is reflected in the motion papers." It's called being stressed out of your mind that you are being sued so you stay up many long nights researching how to write and file papers. This was also my second pro se lawsuit as a defendant. I was previously sued for something similar in a Philadelphia court, see Ashton Technology vs Mary Cummins. I learned a lot from JohnDoes.org . They pointed me in the right direction to similar cases. I also learned a lot from Silicon Investor "Investment chat board lawsuits" thread. A lawyer did not write any of my documents or help me in any way. April 26, 2005. The judge is satisfied with my affidavit. Plaintiff's motion to strike defendant's motion to dismiss is denied. PIKE & FISCHER INTERNET LAW & REGULATION review of case. Note, I never had to pay any fees because the court never had jurisdiction over me. I should have never been served in the first place. The final current docket reflects this. I'm amazed they wrote such a lengthy article about this frivolous case. This was the beginning of internet law so maybe that's it. Or maybe it was because it was a pro se vs a pro se? I found my old due diligence page for Kathy. None of the links work. Note, the photo of Kathy in question was posted on the main page of her own website. I added the "toxic funding is awesome!" part, that's it. This is a photo she herself had on the main page of her website. Awsome! Found your postings from searching for info on "Audrey Stone Dimond." Not much on her under that name.